In my last letter I mentioned how fascinated I am by ancient Greek politics. Fascinated, and I confess, sometimes appalled. The dreadful fate of Thebes* counts as the latter. … incited the Thebans to rebel against Alexander, making great play with the grand old words ‘liberty’ and ‘autonomy’. Those ‘grand old words…’ I am sure I can feel the sarcasm in your voice here. Ever have politicians promised us good things, and ever have they failed to deliver. Of course, this is not wholly their fault for as often as not we want our good things now and cheaply when what is truly good takes time and great effort to achieve. What makes Thebes’ fall particularly hard to take is that it didn’t need to happen. You record that Alexander waited three times so as to give the city time to treat with him. Alas, three times, it refused. Many would say, my friend, that you are at your best when you describe Alexander’s battles. I was most affected, though, by your account of the effect of Thebes’ downfall on the other Greek cities. As you write, they had suffered reversals before, but nothing like what happened to Thebes. No wonder they rushed to do whatever it took to get on Alexander’s good side. Even now, so many years later, I can sense their fear and panic. True, the ancient Greeks lived in unstable times, but the fall of Thebes was, in a sense, the ending of a world. On a gentler (but even more profound?) note, I was most interested to read of the sweating statue of Orpheus. Although I belong to a different religious tradition, we too have known our icons to do strange things not always explainable by recourse to science. Aristander mollified Alexander; I wonder how he would explain icons that bleed? Such a simple and plain way to start the beginning of the expedition that really did change the world! Sometimes, Arrian, you are too dignified for your own good! I like a lot your idea of the letters. It is very original and … I like original. Out of curiosity, why did you choose Arrian over Plutarchos? 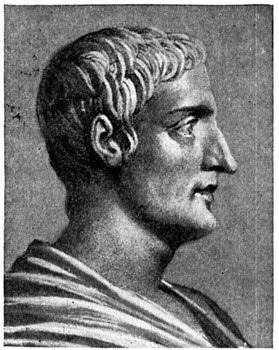 I picked Arrian partly because he seems to have the best reputation so far as Alexander’s biographers are concerned but also because my copy of his book was close at hand when I thought of writing these posts whereas I am not actually sure I own a copy of Plutarch’s! I have too many books and am too little organised with them. By-the-bye, I’m reading Arrian to renew my knowledge of the details of Alexander’s life. If I can finish him, I might move on to Plutarch et al. Oh, that’s a great idea (to move on other writers). It was a long time since I read any of them from the beginning to end, I usually just go for the pieces I need to clarify for my stories. I am looking forward to read all your comments.